There are some high branches that need cutting, but you feel that it s too dangerous to saw them from a ladder. This is a good decision on your part as a fall is an unnecessary risk, especially if you have tools like best pole saws to help you saw those high branches while you remain standing on the ground. Now you may wonder what a pole saw is. Well, it s actually a yard tool with a chainsaw attached to the end of a pole. It is either pre-powered or not powered, but makes tree trimming so much easier. Powered pole saws for tree trimming have a small chainsaw on a pole, and may run on gas, battery or mains electricity. Non-powered versions have a pruning saw attached to it and are a manual pole pruner. Both help you reach and remove branches you would normally need to climb on a ladder to remove. It makes the task so much safer and easier without climbing up and down ladders or constantly repositioning it to cut different branches. 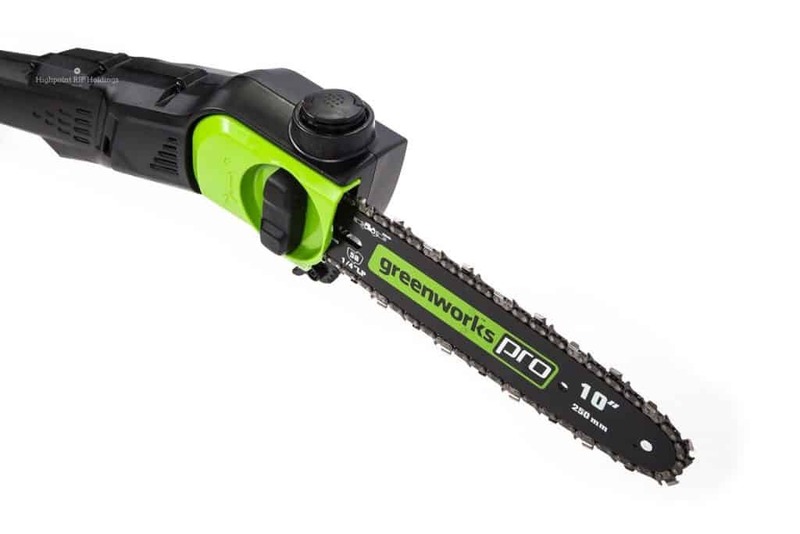 The GreenWorks 20672 is a cordless electric tree branch trimmer powered by a 40V Lithium-Ion battery that has an instant electric start. It has an 8 ? high-quality steel bar with a tensioning system for easy chain tightening. It also has a 3 piece aluminium shaft that can extend to a maximum of 8 . The pole sections are sturdy with little flex, and easily fit together to remove and add extensions as required to get the desired cutting height. With the automatic oiling system, there s no headache of constantly lubricating the chainsaw blade as it s done automatically. Just make sure that there s always oil in its translucent oil tank to extend the chain life with constant oiling. The tank holds 50ml of oil, which should be enough even for a long day of trimming. The unit comes with a 2Ah battery and charger. The battery can work for an hour or sometimes longer on a complete charge. On an average, you will be able to make about 50 cuts on a single, complete charge. With the Lithium-ion battery, you are assured of constant power without any memory loss after recharge. The low-maintenance electric pole chain saw is rather lightweight at 10 pounds, much lighter than most pole chain saws gas tools. The GreenWorks tree trimmer also produces less vibration and noise when compared to its gas counterparts. The saw is on the whole well-balanced and thus, easy to control. The 10 ? WORX WG309 is perfect for cutting all those high branches and limbs without a ladder. All you have to do is attach its 8 extension pole to reach higher limbs and detach it to chop up fallen limbs. As there s no need of using any tools for attaching the pole, the electric tree branch cutter conveniently and easily transitions from a chainsaw to pole with a saw. The chain saw pole saw boasts of a patented tool-free auto-tensioning chain system and auto oil pump with level indicator that prolongs the bar and chain s life. Besides the tool is so much easier to use and maintain thanks to it s automatic oiling and chain tensioning. An interesting feature of this 10 ? compact electric tree branch trimmer its rotatable handle that makes pruning so much easier. You no longer have to worry about any stressing your arms while working because of its handle, and its compact weight of just10 pounds. 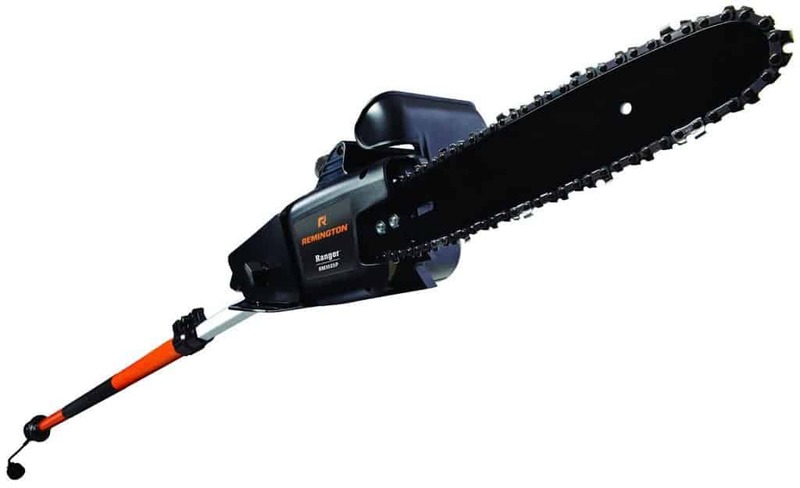 The extended handle chain saw runs on a powerful 8 Amp motor and is perfectly designed for light to medium duty trimming, pruning and cleaning up work. While there s no brake on the machine with the risk of the saw turning on by accident, it s safety locking mechanism has to be disengaged to start using it. Trimming high branches and limbs is so much easier now with the Black & Decker LPP120B Pole Pruning Saw around! This battery operated cordless tree trimmer is powered by a rechargeable 20V Lithium-Ion battery which makes as many as 100 cuts per charge. The battery and charger are however not included. 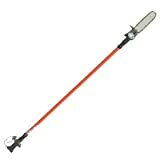 Its telescopic pole shaft easily extends to a length of 6.5-10 feet to provide for a 14ft overhead reach. The chainsaw has its own safety blade guard, and its 8 ? cutting bar easily cuts branches spanning 6 ? in diameter. 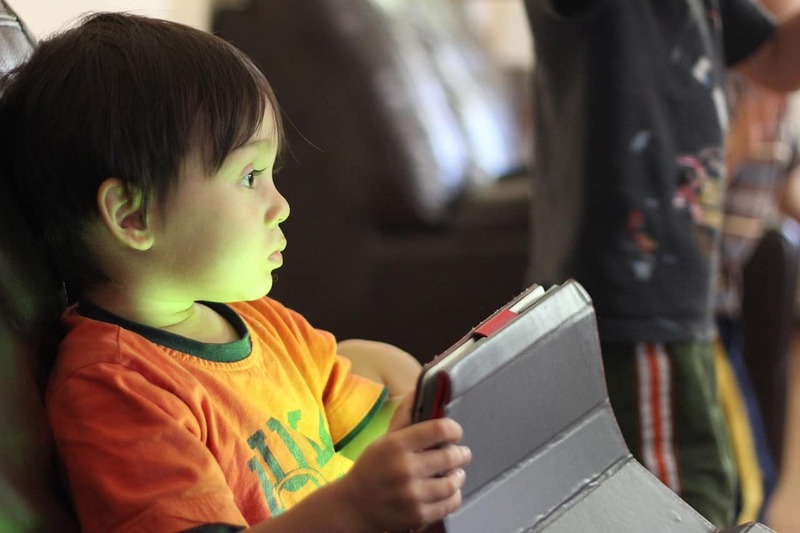 The unit is rather compact and easy to use and carry around as it weighs just 6.3 pounds. 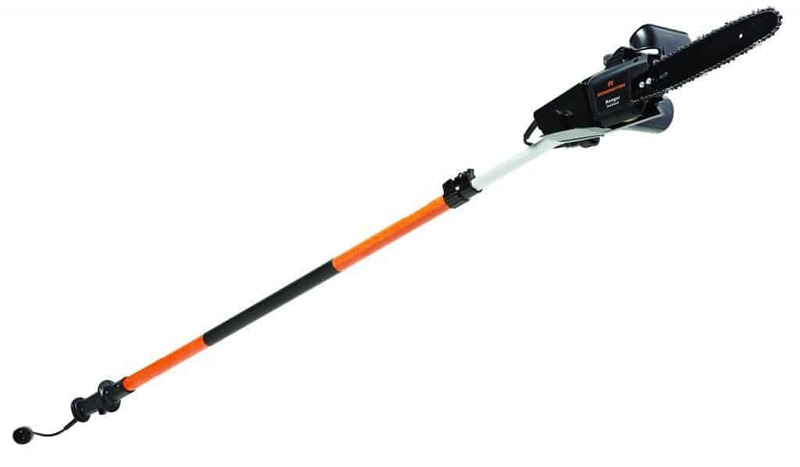 With its Lithium-Ion battery, the tree trimmer pole has a longer lifespan, and offers 5 times better charge retention than NiCad batteries. The unit also has an in-line power-head that makes it easy to control and look in between branches. It can also be disassembled for easy transportation to the worksite. It is perfect for cutting branches quickly. As the chain saw pole trimmer is a bit heavy on the top, it may be difficult to hold it where required especially while cutting under branches before cutting the higher branches. Extension shaft can reach a maximum length of 6.5 to 10 feet. Provides a total and decent overhead reach of 14ft. It s 8 ? cutting bar and chain provides a maximum cutting diameter of 6 ? You no longer have to climb dangerous ladders to trim high branches as the Sun Joe SWJ800E 8 ? 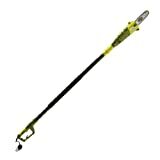 electric pole chain saw does it with you standing on the ground, This is the perfect tree trimmer as its telescopic pole can extend for as long as 8.7ft with a maximum of 15ft overhead reach. Its chainsaw is powered by a 6.5 amp motor and with an 8 ? Oregon bar, with sufficient power to cut even stubborn, 7.5 ? thick branches. There s no need of periodically lubricating the chain system as its auto oiler system automatically does it. This ensures the bar and chain remains constantly lubricated as long as there s oil in the oil reservoir. The electric tree limb branch cutter collectively weighs 8 pounds which is not very heavy. As its battery powered, it is easily started with the push of a button. There are also no fumes or smoke emitted like in gas chain pole saws, nor does the unit need any expensive tune-ups. The SWJ800E has a built-in safety switch that prevents any possible accidental starts and untoward accidents. While Saw Joe is CSA approved, the unit comes with a full two-year warranty. Offers a maximum overhead reach of 15ft. Reaching high branches is so much easier now with the Remington RM1025P Ranger electric pole chain saw in hand. Not only does its strong 10 telescoping shaft give a far reach, it s also lightweight, making it easy for anyone to use. It is powered by an instant start 8 amp motor and it s10 ? long, low kick-back bar and chain effectively trims small to medium-sized branches. The Remington RM1025 quickly converts from pole to chain saw on pole as required. This 2-in-1chainsaw/tree trimmer combo has a long pole that is securely held in place by easy flip and lock clamps. So once you are done cutting high branches, you can easily start a tool-less change from a pole to a chain saw by disconnecting the clamps. You can then start using it as a chain saw to tackle other cutting tasks like slicing right-sized branches. 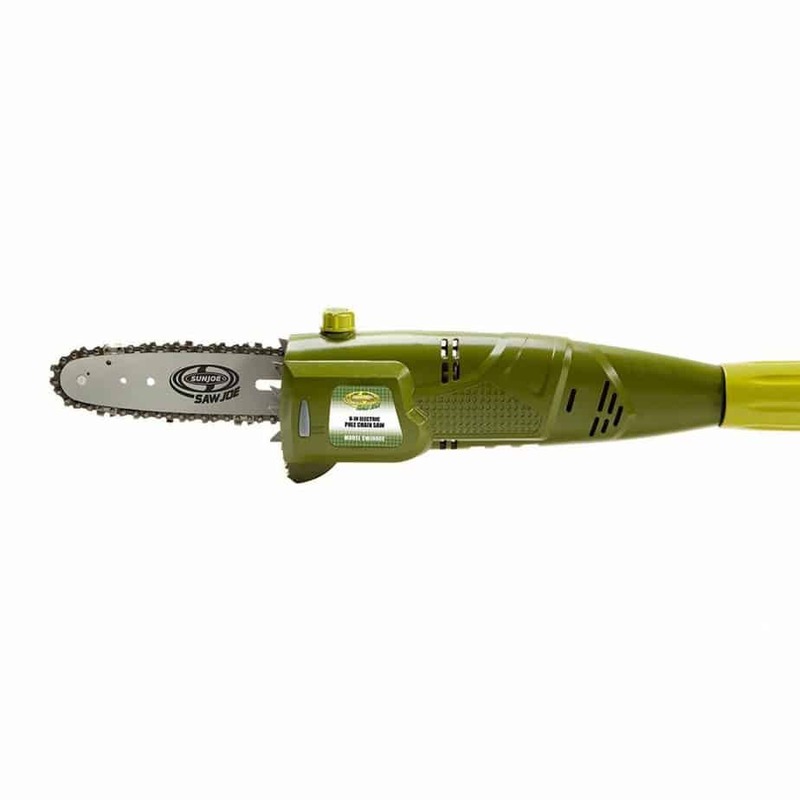 With its non-slip grip, you are assured a comfortable grip while trimming and pruning high branches. The total weight of the pole and the chainsaw is about 11 pounds. Though the saw s horsepower isn t mentioned in its product information, it s strong enough to cut pretty thick branches. 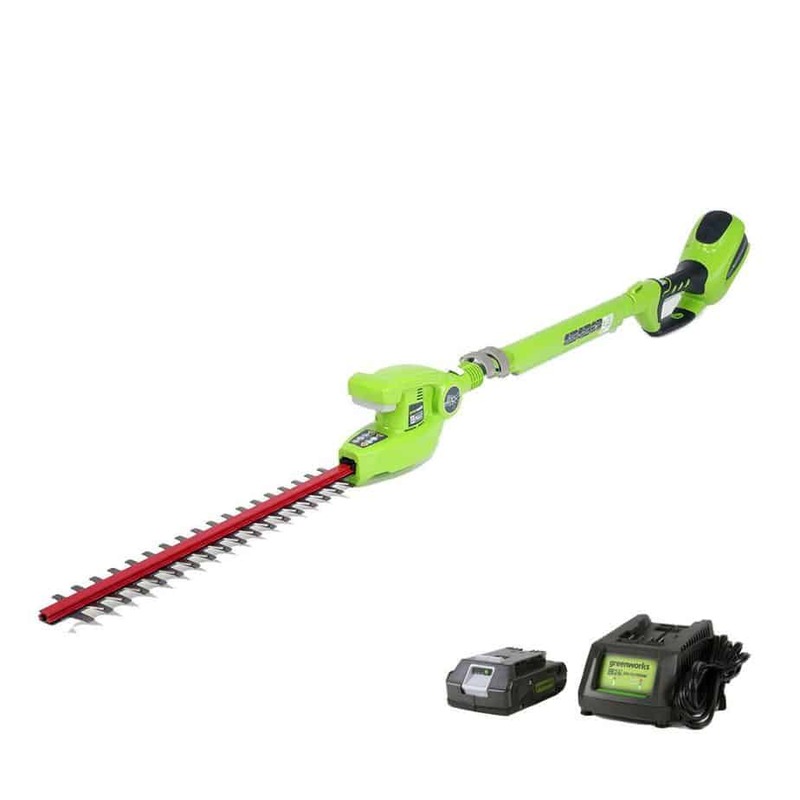 The GreenWorks 22272 G-MAX pole hedge trimmer has easy to use features, specifications, controls and accessories, making it perfect for a homeowner to use in their gardens and home yards. It is not only useful for trimming hedges and bushes but also for landscaping, mowing grass, cutting vegetation and even for blowing away debris and dust particles. The GreenWorks 22272 hedge trimmer easily cuts not only hedges and bushes but also 5/8 ? thick branches. It is powered by a 2AH Lithium-Ion battery that can run for a maximum of 25 minutes when fully charged. It takes about 60 minutes to get fully charged once drained and offers constant power without any memory loss after charging. As this is a cordless tree trimmer, there are no inconvenient cords found in electric models. There are also no fumes and noises associated with pole saws gas powered. One of the reasons this is a popular and powerful hedge trimmer is because of its 20 ? durable dual action stainless steel blade that easily resists any wear and tear. 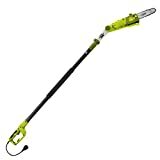 The GreenWorks 22272 G-MAX comes with a telescopic shaft that adds convenience to its usage as it can be extended to a length of 5.5 ft. to 6.3ft. to perform jobs not possible by most other hedge trimmers. It s three-position pivoting head and adjust blades also adds to its convenience as you can turn the head as required to cut even the hard-to-reach branches. With its 4 year manufacturer warranty, you are assured of its long-term product reliability. Power will be your number one aspect in outdoor equipment, and the GreenWorks Pro 80V 10 ? Cordless Pole Saw is a tool known for its power. In fact, it makes landscaping so much easier with its powerful 80V battery going from zero to power at the push of a button. With its heavy grade construction and long-lasting performance, it s perfect for homeowners to use for both small and big jobs. A cordless power saw, the GreenWorks Pro 80V electric tree trimmer pole does your work with minimal vibrations, noise and mess. All you need are a few additional batteries, a rapid charger to quickly charge batteries and a multiple tool compatibility platform to take care of all your landscaping with the power of a gas tree trimmer but at the lowered cost of an electric pole chain saw. The 10 ? long bar and chain located at the end of the shaft easily and quickly cuts through branches and limbs as thick as 6 ? in diameter. The tool boasts of an automatic oiler that automatically lubricates the chain and oil for its prolonged life and durability. Its translucent oil tank helps to easily monitor and maintain oil levels. Making adjustments is so easy and quick with it s easy-adjust chain technology. It also boasts of digitally controlled, quiet brushless 80V motor that offers exceptional torque for optimal cutting performance and long run times. With its lightweight, extendable 3 piece aluminium shaft you are assured a maximum reach of 9ft while using the tool. You no longer need a ladder with the TrimmerPlus PS720 8 ? pole saw to help you with your yard work. This is a comparatively cheap gas power saw on a pole that s lightweight and user-friendly in design. Affordably priced at less than $100, the TrimmerPlus still offers a surprisingly large selection of handy features. It is perfect to use for pruning and cleaning up hard to reach trees and for most yard trimming work thanks to its chain s consistent and stable flow of power. It s easy and tool-less connection with most trimmers with split boom capabilities helps turn your tree trimmer into different products for different tasks. 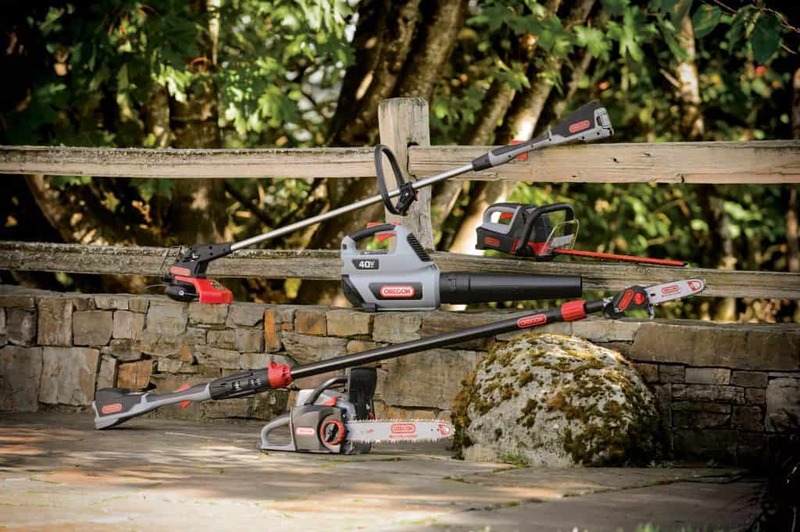 Choose from Remington, Craftsmen or Troy-Bilt attachment capable string trimmers to complete as many tasks as necessary. With the PS720 s 2-section add-on shaft, it s possible to trim tree branches at a 7-foot length or extend your reach to 12 feet without the use of any additional ladders. This proves helpful to handle different back yard tasks and cleaning. The 8 ? bar and chain has a self-lubricating system that helps maintain its optimal cutting performance. The TrimmerPlus weighs about 7 pounds and is easy to carry around. However despite being lightweight, it can easily cut logs up to 16 ? in diameter. 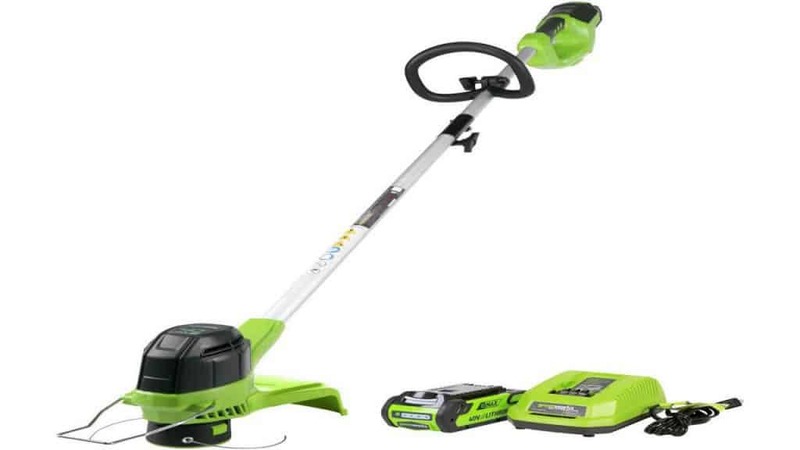 The TrimmerPlus PS720 is durable and made using high-quality materials. It has a good quality Oregon brand bar and chain, and is backed by a 2-year limited warranty. There are different types of tree trimmers divided based on its power source. There are gas powered ones, electric tree trimmers which come in corded or cordless options and manual units. Each has its individual pros and cons which you need to examine and make your final choice based on your budget and tree trimming necessity. Gas powered pole saws for tree trimming offer the best in performance and power with it s heavy-duty bars and chains. Gas tree trimmers can effectively cut bigger trees and branches than their electrical counterparts. It usually comes with a 9 tall shaft that helps you easily trim tall trees. Though its engines are heavier than electric motors, they are well balanced and easy to operate. They thus make a better option if you have large areas to maintain and lots of trees to cut. A portable tree branch trimmer, this is the preferred choice by professionals for commercial reasons as they are built to higher specifications to last longer. Of course, there are also some gardening enthusiasts who prefer using these tree trimmer poles as it s a more powerful option for difficult cutting jobs. However they do create more noise than electric motors, and need more maintenance like periodical checking of spark plugs and cleaning air filters. Its gas tank also has to be constantly refilled, which means additional effort and money spent. Electric pole chain saws are better for small tree trimming work as they are not as powerful as the gas powered versions. However they do not require so much of maintenance as all you may have to do is sharpen the blades and oil the machine. They are also less noisy than their gas counterparts and don t produce any fumes when in use. These electric pole saws for tree trimming are again divided into corded and cordless versions. 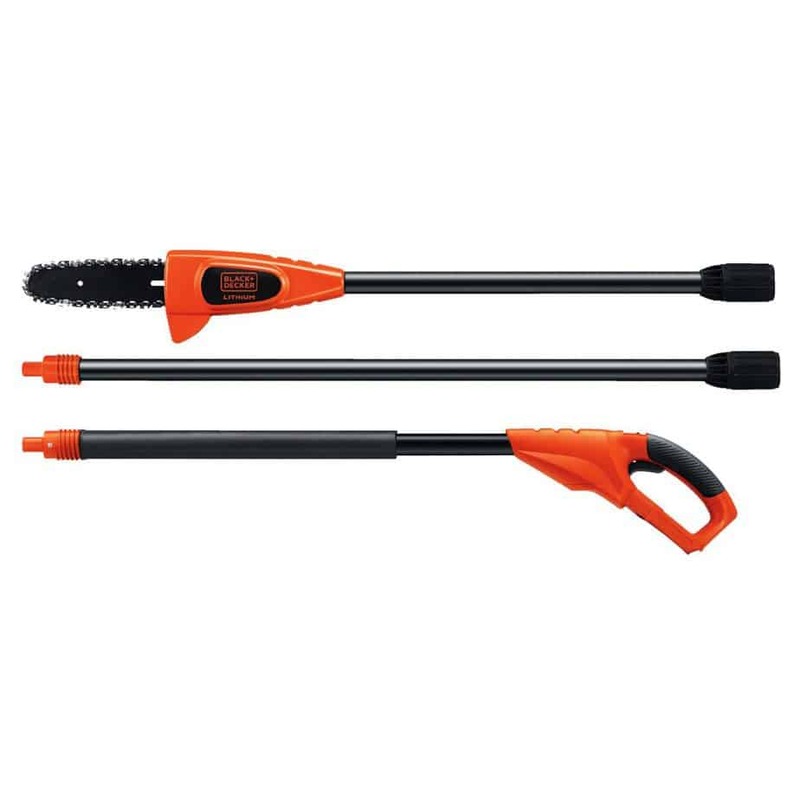 The corded electric tree branch trimmers are easy to use as you just have to plug it into a power source to start using it. They are lighter than the cordless versions as it doesn t have the battery s added weight. Though portable, it s only for as far as the cable permits. They are however more powerful than their cordless counterparts as they are attached to a power outlet that offers a constant power source. Their cutting blades are usually a maximum of 10 ? long, and operate reasonably quietly. However these electric tree branch cutters may not easily cut thicker branches, especially when compared to gas variations as they don t have the same power capacity. And as it has to remain connected to a power outlet, you may have to buy additional extension cables to reach far places. Cordless pole sawsA rechargeable battery powers cordless electric pole chain saws where a recharge typically lasts for about an hour. 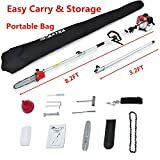 These electric tree branch trimmers are completely portable to carry and to use wherever required, are relatively inexpensive and generally have a shorter bar length of only 8 ?. As these units are user-friendly and efficient, almost anyone can use it. While the battery offers the convenience of using the electric tree saw wherever required, they are also the reason why these are the least powerful electric tree limb branch cutters available as it stops functioning once its battery is drained. So there s the additional chore of regularly charging the battery which some people consider an inconvenience. However they are the least noisy, don t have inconvenient power cables lying around the garden or work site, don t need a power outlet to work and there s no headache of checking fuel levels. This is why they are better for smaller gardens where there are few trees with large branches to trim. As they don t need much maintenance besides chain sharpening, it s a better option over gas-powered variants. While they are available with Ni-Cad or Lithium-Ion batteries, it s however better to look for units having a Lithium-ion battery and not Ni-Cad battery. Lithium-ion batteries boast of better performance, have a longer life and do not reduce in its performance as the batter loses its charge. 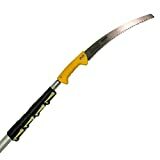 The fourth type of tree pruning saw is a manual one, which is also called a pruning saw. It s literally a stick with a blade on its end where some of them may have a string pull activating the clamp between two blades. You just have to place the saw around the branch, and pulling the cord cuts it. Some units may have a serrated blade which cuts branches when pulled up and down. These saws are advisable only if you have a very small pruning job, or if you are on an extremely small budget. Now is the task of choosing your tree trimmer which you have to do depending on your requirements. You not only have to consider the power type, but also its size and price. Tree trimmers are available in various designs, types, saw blade lengths, pole lengths and power type and size. You can choose the bar length roughly based on the size of branches it can cut. Some tree branch trimmers can also be used for sawing at ground level by detaching the chainsaw from the pole. Here are some features which will help you choose the best power pole saws for yourself. 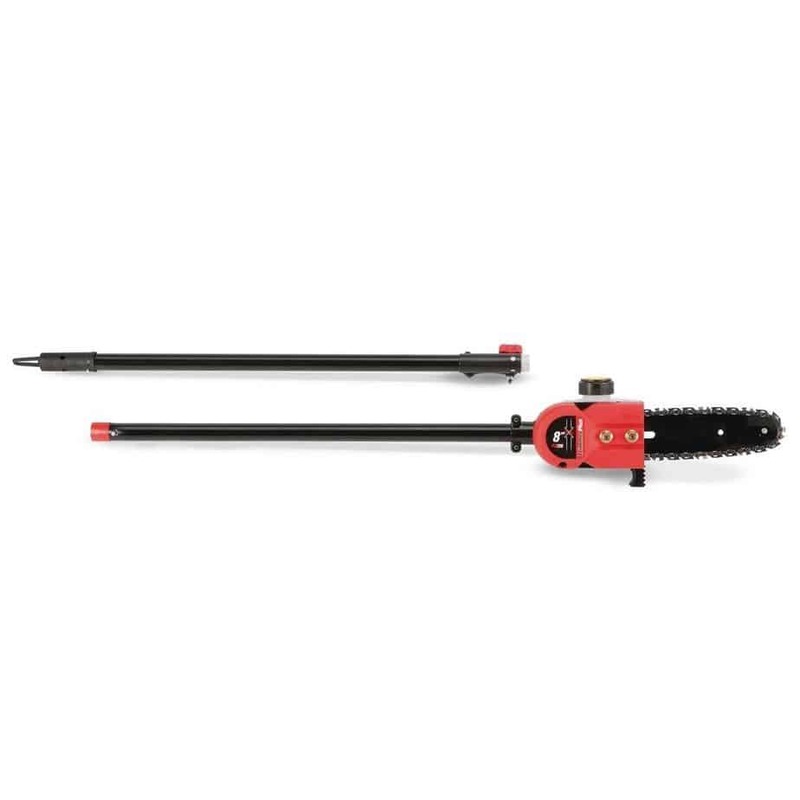 The chain saw pole trimmer s bar is an important feature as it s the blade where the chain is mounted on. It improves your tree branch trimmer s usability as the longer it is, the bigger it s cutting area and thicker branches it cuts. Its length is usually measured in inches where 8 ? is the regular size. However there are also other sizes available that are 6 ?, 10 ? and 12 ? in length. Choose a unit with a bar length longer than the thickest branches you ll be cutting. While the cordless versions have the shortest bars, the gas or petrol versions usually have the longest bars. It s the extension pole that gives the tool its name and usefulness. Choose your tree branch trimmer based on how long and adjustable the extension pole is. You have to check its minimal and maximal lengths. You may find it difficult cutting lower branches if it s too long even at minimal extension. Similarly, you won t be able to use it to cut higher branches if its maximum length is not long enough. The poles are usually made from fiberglass or steel, and while most are extendible, there are a few with a fixed, single length. Pole chain saws with extendable poles may be more expensive than fixed poles. However they are not only easy to store and transport, but also helpful while working on trees of various heights as it can be extended as required. Some manufacturers mention the pole reach, and not pole length. You have to be careful about this as both are different. While pole length is the length of the pole, pole reach includes the length of the pole and an average person s height. If you don t note the packaging, and if the manufacturer mentions only the pole length or reach, you may end up buying a shorter or longer tree trimmer than required. Weight is important as you will be holding the unit over your head for at least a few minutes, while pruning those high branches. So make sure you are comfortable holding it for so long. No matter how much and where you will be using pole pruners, you need power to work. Gas powered models are better for large and perhaps commercial jobs where you have to cut large logs of wood. Electric models are better for personal or domestic use, or if there s not too much of pruning or trimming to do. This is a unique feature found in pole pruning saws where a well-balanced unit makes your job easier. They offer better maneuverability and are fit for prolonged use. This is why the latest models have their engines/motors placed in the middle, with differently constructed poles. Some pole chain saws can be connected to attachments to use for other purposes like as a hedge trimmer. So if you plan to use your tool for multiple purposes, then you may need one that comes with attachments. You also have to consider the property size and what you intend to use the tree trimmer for. For example, if you want to trim a small garden with a few trees, then a short, manual pole pruner or an electric unit should be enough. However if you have a large property with lots of trees to trim, then a gas powered one is better for its strength and reach. Budget is always an aspect to consider while buying something, including chain saws on pole. There are different models and brands of pole saws ranging from under $100 to as much as $500. You obviously have to choose a model that fits your pocket. Regarding brands, there are various famous brands to choose from. It s always better to buy from a reputable brand, known for offering excellent products for your money. Examples are Husqvarna, Remington, Poulan, Troy-Bilt, GreenWorks and Earthwise. It s better to check the customer pole chain saw reviews you plan to buy. You get to know a lot about the product through these reviews like any faults and difficulties the users may have had while using pole tree trimmers. Considering both the advantages and disadvantages of palm tree trimmers before buying saves lots of regret later on. 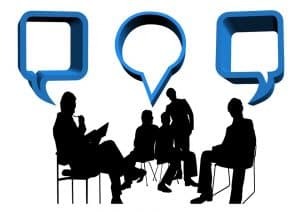 Besides, the top-rated brands may not always be the best as sometimes new and some smaller brands are equally good in functioning, and are usually cheaper in price. Safety is important which is why some chain saw on a long pole has a safety locking mechanism to prevent unwanted accidents. It is only after the mechanism is disengaged, that you can start using it. So you should now be able to make a choice based on all this information about tree trimmers. You know how to decide which the best pole saws are for your tree trimming requirements, and how to use customer reviews to your benefit. Here are a few pole saw reviews for you to go through, to help you make your final decision. You just have to compare them and choose with the help of all the information acquired here.